Promotional marquee displays are the ultimate in big advertising! with your branding emblazoned accross all panels these popup displays are brilliant for outdoor events, carnivals and promotions. We can manufacturer these displays in any size and layout. The marquee display comes as a kit ready to assemble, complete with carry bag and all required materials and items required for setup. 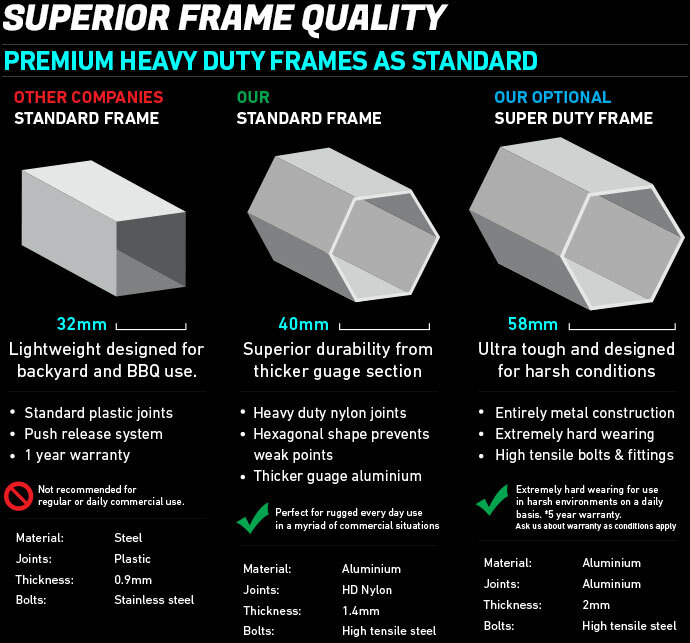 All framework is luxuriously anodized aluminium, this provides strength without the unit being too heavy to transport. This means not only a longer lasting marquee display but increased safety for people walking in and out of your tent. We also back the framework up with non-breakable HQ nylon plastic accessories & joints, heavy duty reinforced ribs. UV proof, Water proof, and Fire retardant material. There are no tools required for assembly the entire unit pops up in less than 5 minutes.